The Ministry of Foreign Affairs (MFA), on 29th June, issued a press release saying that China’s building of a road inside Bhutanese territory is a violation of the 1988 and 1998 written agreements between the two countries to maintain peace and tranquility and the status quo pending a final settlement on the boundary question. The release said the road building also affects the process of demarcating the boundary between the two countries. The MFA release was referring to road construction by the Chinese Army which started constructing a motorable road on 16th June 2017 from Dokala in the Doklam area towards the Bhutan army camp in Zompelri. Earlier Bhutan’s Ambassador to India, Major General V. Namgyel on 20th June had issued a formal ‘demarche’ to the Chinese Embassy in Delhi asking the Chinese side to stop the road construction stating similar points as the above MFA release. Meanwhile, India’s Ministry of External Affairs (MEA) which has so far kept silent about the issue came out with a release on 30th June. The MEA release mentioned the release by the MFA and its salient points. The MEA said that on 16th June, a PLA construction party entered the Doklam area and attempted to construct a road. “It is our understanding that a Royal Bhutan Army patrol attempted to dissuade them from this unilateral activity. 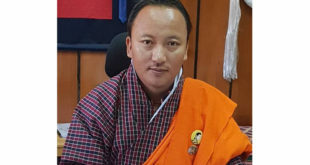 The Ambassador of the Royal Government of Bhutan (RGOB) has publicly stated that it lodged a protest with the Chinese Government through their Embassy in New Delhi on 20 June,” said the MEA release. The MEA said that in keeping with the tradition of maintaining close consultation on matters of mutual interest, the RGOB and the Government of India (GoI) have been in continuous contact through the unfolding of these developments. “In coordination with the RGOB, Indian personnel, who were present at the general area in Dokala, approached the Chinese construction party and urged them to desist from changing the status quo. These efforts continue,” said the release. The MEA said that the matter has since then been discussed between the Foreign Ministries of India and China. The release stated that India is deeply concerned at the recent Chinese actions and has conveyed to the Chinese Government that such construction would represent a significant change of status quo with serious security implications for India. The Indian side underlined that the two Governments had in 2012 reached agreement that the tri-junction boundary points between India, China and third countries will be finalized in consultation with the concerned countries. The release said that any attempt to unilaterally determine tri-junction points is in violation of this understanding. Meanwhile, in a 29th June press briefing, when asked about the ‘demarche’ issued by Bhutan’s Ambassador to the Chinese Embassy on the road issue, the spokesperson of the China’s Foreign Ministry in Beijing claimed that its activities in Doklam are ‘justified and lawful’ as the territory ‘belongs’ to China. These claims are not accepted by both Bhutan and India. 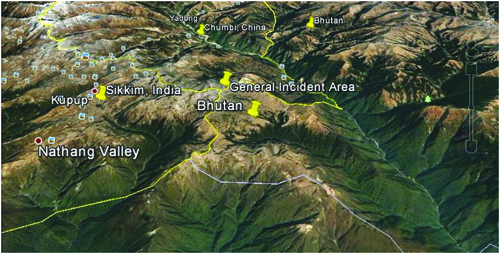 The Bhutanese has learnt that the incident happened near the tri junction or ‘Gyemochen’ where the borders of the three countries meet with only a few kilometers separating each country. There has been some confusion as each country calls the general area by its own designated names. For Bhutan, the larger area where the incident occurred is known as Doklam. The Chinese road building team with its equipment and soldiers was attempting to do some site cutting to extend its road down south towards a Bhutan Army camp at Zompelri. Some social media followers in Bhutan are currently confusing the road incident with another zig zag road on the Phutegang ridge, which is also disputed with a Chinese military outpost on one side and a Bhutanese outpost one on the other side. However this road points eastwards towards Haa and there has not been any incidents here. Whenever there have been attempts to change the status quo on the ground in the past Bhutan has protested and brought up the matter with its counterparts on the Chinese side. As mentioned above the Royal Bhutan Army first tried to dissuade the Chinese road construction team that refused to cooperate. This was soon followed by Indian soldiers who entered the area and halted the construction. The Chinese soldiers in response came back later and destroyed a couple of small Indian military outposts in the narrow geographical vicinity. The area through which China is trying to build the road is Bhutanese territory, which is also claimed by the Chinese and is part of the ongoing annual boundary negotiations. The Chinese side has built a major road till the Yadong town in the Chumbi valley. The attempt by the Chinese is to take as much roads as it can from there to the Indian and Bhutanese borders in the vicinity. However, especially for India, any roads moving south towards the Chicken neck is seen as being particularly harmful for its security. The chicken neck is a small piece of land that connects mainland India to its seven north eastern states some of which have restive militancy related problems. In strategic circles the Chumbi Valley is seen by India as a dagger pointing to its chicken neck. However, for the Chinese side its efforts in the region are hampered by the fact that while it has territory in the Chumbi valley, it lacks the ‘strategic shoulders’ due to the narrowness of the entire area with India and Bhutan one both sides. This in part explains why China is claiming 269 sq km of Bhutanese territory in the area as it would get the necessary strategic shoulders and space to operate more freely. India, on its part, sees this as a major threat. 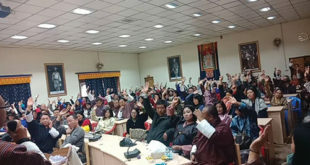 For Bhutan, loss of any territory or incursions into its areas is not welcome as discussed in several past National Assembly sessions, with both pre-democracy Chimis (representatives) and also the post democracy MPs from the area bringing up the issue of encroachments from the Chinese side. Highlighting the strategic importance of the area China in a package deal in 1996 ‘offered’ to ‘give up’ its claims to 495 sq km of land in the Pasamlung and Jakarlung valleys in Bhutan’s north-central sector of Bumthang in return for giving up the 269 sq km in Doklam to China. Bhutan’s boundary issues with China started from the 1959 onwards with the PLA’s invasion of Tibet and Bhutan’s subsequent closing of its northern borders. 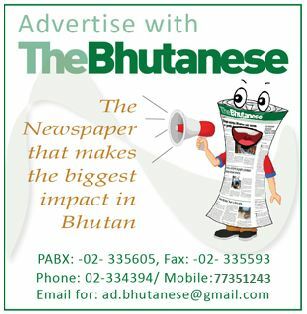 Events at the time also drew Bhutan closer to India. China also refused to recognize the traditional watershed principle that had decided the boundaries between Bhutan and Tibet. In the 1950’s and 60’s China kept publishing maps that claimed sections of Bhutanese territory with no clear basis. Initially Bhutan’s boundary issues were handled in consultation with New Delhi which held talks with China. From 1984 onwards Bhutan started to directly handle the issue with China, culminating in the first boundary talks in the same year. In 1988 some broad guiding principles of the talks were agreed upon to maintain peace and not use force to change the status quo. This was further elaborated and defined in a more detailed agreement in 1998. Between 1984 and 2016 there have been 24 rounds of boundary talks with the Chinese side. The 24th boundary meeting held in Beijing endorsed the report of the Joint Technical Field Survey of the disputed areas in the western sector carried out by the expert groups of both sides. While tensions have been heightened over the issue, diplomatic and strategic experts in several news articles from India ruled out any major escalation of the issue as neither China nor India would want military conflict on its borders. It has been pointed out that this is also not the first border issue as there have been others in the past usually ending in talks. China Must be Taught some.lessons ..
its time for us to get united against China and fight for every inch of our mother land. We never allow that aggressive giant to take away the Doklam, which is indispensable part of Bhutan. Thanks to Indian army, to show their loyalty towards Bhutan in this critical time. There is no China-Bhutan border. There is the border between Chinese-occupied Tibet and Bhutan. Note that China illegally occupies Tibet. We need to accept that china is abigger power now. This also necessitates the need of unity among smaller countries. China sometimes uses its economic might to pit one country against other. 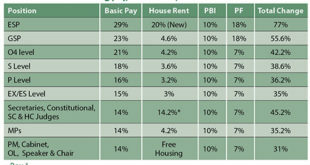 We need to resist being trapped by its financial help. It is time that countries like Bhutan, Nepal and others to join India and fight against this aggressive bully. The age old brothers Butan and India stood for one another in critical times and proved the world that this bullying Dragon can be tamed with utmost dignity unity and patience.